In a healthy mouth the gum tissue wraps around the gum tissue. There it forms a pocket around the tooth that is one to three millimeters in depth. During normal tooth brushing the tooth brush bristles get into and clean out the bacteria in the pockets. When home dental care is lacking and you have not been to the dentist for regular cleanings bacteria will build up on your teeth. The bacteria will start to calcify and form a hard substance called calculus (tartar). The calculus can not be removed by tooth brushing and can only be removed by your dental hygienist with a procedure called Scaling and Root Plaining. Scaling and Root Planing is the processes of actually removing the bacteria and calculus from the teeth. The goal of Scaling and Root Planing is physically remove sources of infection from the teeth. This will allow the gum tissue to reattach to the tooth and decrease the pocketing around the tooth. If the calculus is left on your teeth it will cause dental decay and cause periodontal disease. Also, an advanced Laser is used to help eliminate bacteria around the teeth. Your hygienists will place a laser into the gum tissue pocket around your tooth. Then the Hygienist will use a foot pedal to run on the laser energy. The laser is at a specific wavelength that seeks out bacteria and destroys the bacteria. The advanced laser treatment is quick and painless and leads to better overall gum tissue health. 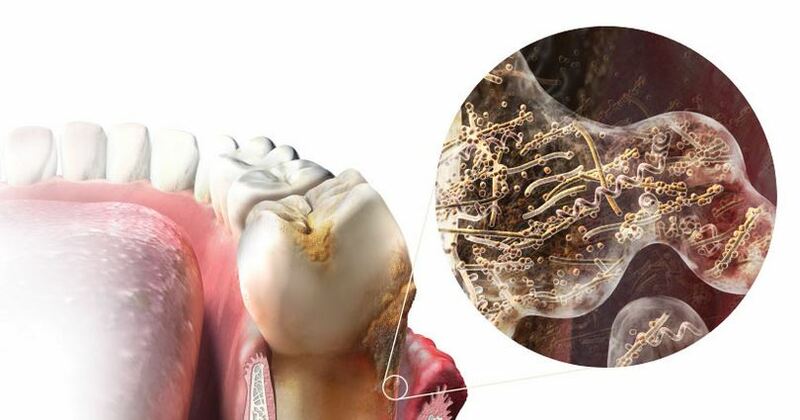 Periodontal disease (gum disease) is a bacterial infection of the gum tissue that surrounds your teeth. Gum disease is the main reason for tooth loss in adults. Unfortunately, periodontal disease does not hurt and patients do not know that they have a bacterial infection. During regular dental checkups Dr. Nugent and your Hygienist check for signs of periodontal disease. This examination is done by measuring the pocket between your teeth and gums. Periodontal disease is caused by a buildup of bacteria. The bacteria forms plaque which is a sticky blanket of bacteria. If the plaque is not removed daily it will continue to build up and form calculus. This bacterial accumulation release toxins that damage the gum tissue and bone. 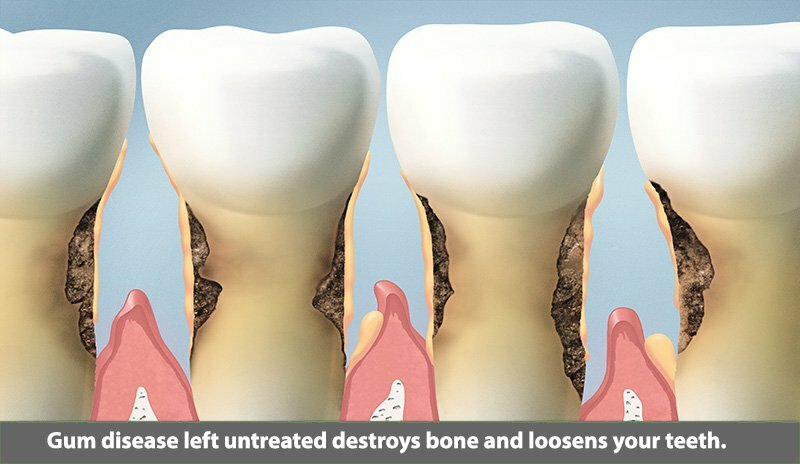 The more damage that is allowed to happen results in more destruction of the teeth support system. The teeth become mobile and eventually are lost. Periodontal disease has two forms: gingivitis and periodontitis. Gingivitis — This is the initial stage of gum disease. The gums tissue becomes red, puffy, swollen, and bleeds easily. At this stage, the disease is treatable and can generally be eliminated by daily brushing and flossing. Periodontitis — If left untreated, gingivitis will develop into periodontitis. The gum tissue and bone that support the teeth will be irreversibly damaged. Gum tissues that have severe bacterial infection with periodontitis will cause teeth to become loose, fall out, or have to be removed by a Dr. Nugent. Proper brushing and flossing is key to good home dental care. Furthermore, regular dental checkups and periodontal examinations at Dr. Nugent’s Pasadena Texas Dental Office is extremely important for maintaining your dental health. Visit us at 3421 Burke Rd STE A, Pasadena, Texas 77504.